The NRC draft of Assam has created quite a flutter in India with the opposition parties trying to fear monger about 40 lakh people not featuring in the list, even though, the draft is by no standard a final one. Supporters of opposition parties have now resorted to blatant lies and concoctions. A tweet surfaced today that enquired whether the information on Biplab Deb, Tripura Chief Minister’s Wikipedia page was true. The page had been edited to reflect that Deb was born in Bangladesh. Upon investigation, it has been revealed that the Wikipedia page of Biplab Deb has been consistently vandalised recently that the misinformation of him being born in Bangladesh was also a result of vandalism. When one accessed the edit history of the Wikipedia page, a comparison between revisions makes it evident that originally, the page read that Biplab Deb was born in Tripura, and only on 2nd August 2018, was the malicious edit of him born in Bangladesh added. 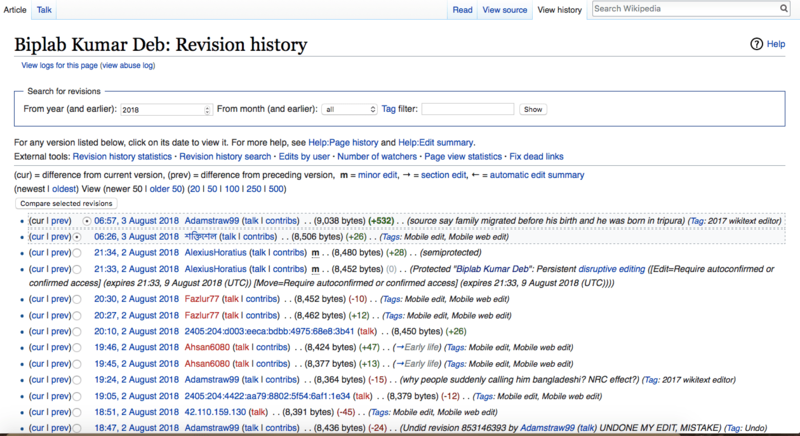 The edit history of the Wikipedia page shows that the vandalism was done from an IP address 117.194.210.250, which belongs to Kolkata. It should be noted that IP addresses can be spoofed too, but normally Wikipedia employs tools to stop such elements from vandalising their pages, so in all probability, someone in Kolkata carried out this vandalism. One wonders who in West Bengal will be motivated to undertake this vandalism related to an issue in Assam. Perhaps West Bengal’s Chief Minister’s passionate statements on Assam’s NRC gives a hint. 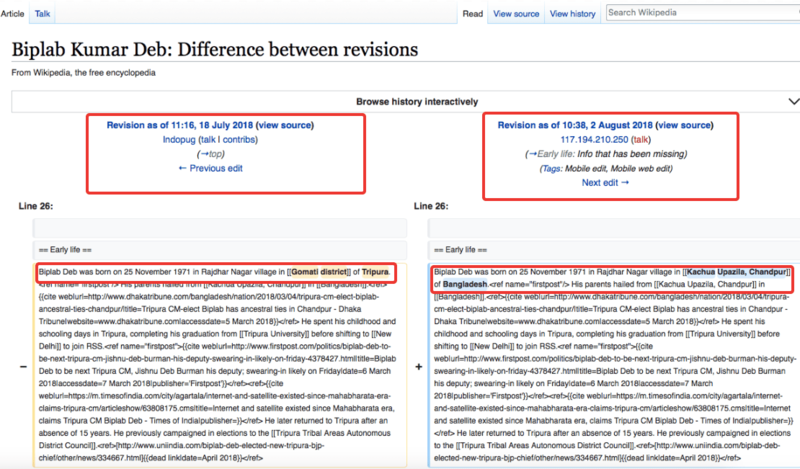 The Wikipedia page of Biplab Deb has been constantly vandalised since 2nd August 2018 as evidenced by the edit history of the page. After consistent vandalism of the page on the Tripura CM, Wikipedia has locked the page to stop vandalism. The current version reads that Deb was born in Tripura.